Cooking for friends in our house is very much a social event and what could be better than cooking a paella al fresco over open flame, with good wine and great company. The inspiration for this dish comes from a small beach restaurant on the Costa del Sol where they make paella as a specialty. We have spent a lot of time in this area and been fortunate enough to witness this dish being created many times. We cooked this for 10 people over open flame as the wood gives it an incredible smoked flavour, combine this with the garlic, chroizo, saffron and smoked pimenton and you get the true aroma of Spain. This is our take on RA-MA's famous Paella. I hope you enjoy! If you are not feeling adventurous this can be cooked in a frying pan in your kitchen. Get your pan onto a high heat, you do not need to add any oil as the chorizo will produce enough as the fat renders down. To begin add your roughly chopped chorizo and stir until crisp. To this add your chicken and pork, stir until browned. Add the onion, garlic and sliced peppers and keep stirring until well softened. If you are cooking this over an open fire the chances are the pan will be piping hot at this point. 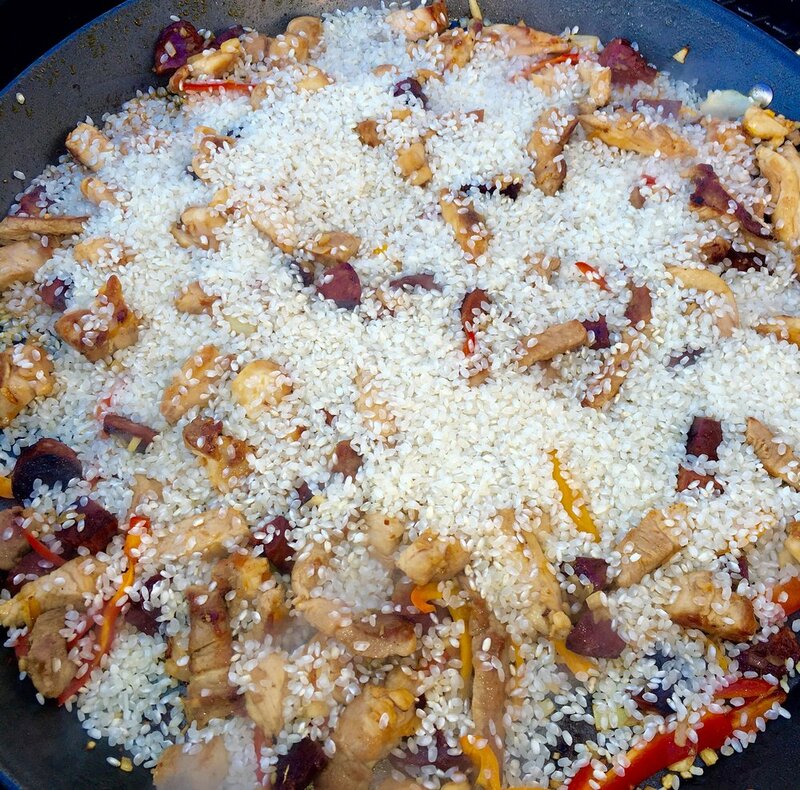 It is important for the success of the dish that you do not burn the garlic so stir vigorously then add your rice in one go, spread across the pan then add 3/4 of the chicken stock infused with saffron, dust over two tbsp of pimenton and stir. At this point you want to reduce the heat and let the dish simmer. We did this by simply placing some paving bricks directly onto the grill and placing the dish on top. It is important you reduce the temperature because although you want a nice crust on the bottom (called the socarrat) you do not want it to burn. Rest a lid over the dish, stir every few minutes until most of the stock has been absorbed. Now you need to pay attention to determine how much extra stock the paella will need and adjust the seasoning. First taste the rice and season accordingly. If the rice is still al dente then add some more stock, stir and put the lid back on Repeat this process until the rice is cooked and all the stock has been absorbed. Once cooked squeeze over the juice of one lemon, dress with sliced roasted red peppers, lemon wedges, prawns, chopped flat leaf parsley and a dusting of pimenton. Serve this simply garnished with fresh flat leaf parsley.